Problems with skin elasticity, texture, tone, and colour can have an adverse effect on the overall appearance of a person. Skin that has become dull, loose, and has uneven tone can make a person look unhealthy, lifeless, or old; these skin problems can reduce the vibrancy of the overall look of the individual. 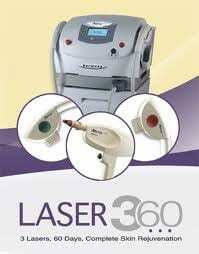 What is Laser 360 Treatment? The Laser 360 treatment is a photo rejuvenation program combining a laser package treatment that can effectively be used to address a variety of conditions affecting the skin. The laser 360 is effective in achieving improvements in skin color, tone, texture, and elasticity in a non-invasive manner; it is composed of three different laser systems administered to a patient over a period of 60 days (hence the name, Laser “360”). The Laser360 skin resurfacing and rejuvenation treatment is guaranteed to reveal skin that is brighter, younger, and healthier-looking, from the inside out. The Laser 360 treatment effectively addresses skin concerns such as fine lines, wrinkles, and discolorations from deep within the skin, to bring about a vastly improved skin condition. The results obtained from a Laser 360 treatment program may be affected by the patient’s vigilance to avoiding prolonged exposure to the sun’s harmful rays with protective clothing, and with the use of mineral sunscreens as prescribed by the attending Kent physician. Most patients choose to have touch-up treatments administered to be able to maintain the results. In addition, lifestyle and dietary habits may affect the patient’s skin well after treatments are performed. There is no down time after a Laser 360 treatment; the patient can immediately go back to work, or to doing normal tasks and activities after the procedure is done. AFT intense pulsed light for colour -Pulses of light will effectively even out the skin colour, helps in the reduction of tiny broken blood vessels and other irregularities in the skin colour. Near-infrared for tightness – Deep heating will help firm up any loose skin so to achieve a more youthful, contoured appearance. Pixel® for texture and tone – This precision laser creates thousands of microscopic perforations to stimulate the production of new collagen. The new collagen is expected to improve the skin’s texture and tone, to smooth out wrinkles and fine lines. The skin around each of the perforations that are made remains intact, enabling the skin’s top layer to heal from the edge of these tiny holes very rapidly. Each technology is administered through a simple 360 Laser treatment hand piece, which is placed against the patient’s skin. The treated area will be rejuvenated over the course of the specified and customised treatment plan. The treatment usually takes just a few minutes to be finished (for each technology used), allowing the patient to return back to his or her usual activities after the treatment is finished. The device used to administer the Laser360 treatment, which is called the Harmony®XL, has been cleared by the FDA for the treatment of over 60 aesthetic and medical conditions. Thousands of patients from all over the world have already been treated with the Laser 360 program, and have since started enjoying the skin improvements brought about by the complete treatment. Loose skin on the upper lip, under the eyes, neck, around the mouth, forehead, cheeks, and chest areas can be tightened with a Laser 360 treatment. The non-invasive treatments will be administered in three treatment sessions spread over a period of 60 days to obtain skin tightening results on the specific areas that have loose skin. A Laser 360 treatment can also even out the skin tone or skin colour of a patient, to achieve skin that looks more uniform to behold – and with improved skin tone and texture. The appearance of tiny broken blood vessels can be remedied with a Laser 360 treatment through a series of three treatments administered over a period of 60 days. The Laser 360 treatment will be effective in eliminating the appearance of unsightly broken blood vessels that are visible through the skin surface, so that the skin is free from blemishes and unattractive redness.